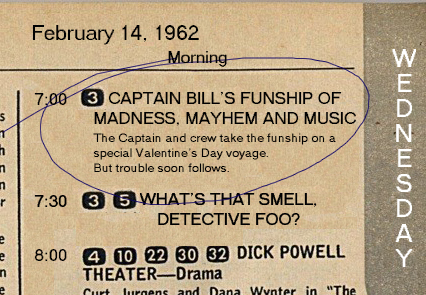 period news clippings — "Captain Bill's Fun, Fun, Funship... of Madness, Mayhem and Music"
Special thanks to Dan in Tarpon Springs, Florida for researching and sending these. If you've found others, please scan and send them here. St. Petersburg Times Press Photo showing Captain Bill at a local ribbon cutting ceremony, 1963.